Calmet was greatly admired by the philosopher Voltaire, who visited the abbey on several occasions. Calmet died at Senones Abbey, in the Vosges, near Saint-Dié, on 25 October 1757. 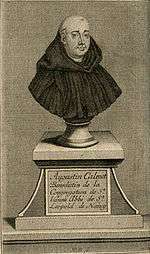 Augustin Calmet born the 26th of February, 1672 in Ménil-la-Horgne, near Commercy in Lorraine, in a modest family as the Antoine Calmet. His father was blacksmith. 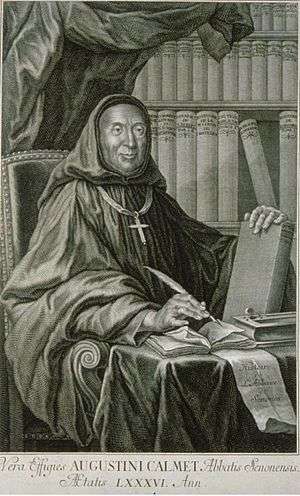 After entering the Priory Benedictine Breuil, he joined 15 years at the University of Pont-à-Mousson and follows the course of rhetoric from father Jesuit Ignace The Aubrussel (later the confessor Queen of Spain). At the end of these studies, he joined the Benedictine order of the Congregation of Saint-Vanne and St. Hydulphe. His novitiate is made to the St. Mansuy Abbey Toul where he made his vows the 23rd of October, 1689. He was then sent to study philosophy at St. Èvre Abbey and those of theology at Munster Abbey. Ordered Priest the 1 of Arlesheim near Basel, and said his first Mass in the Abbey of Munster on April 24, 1696. He was commissioned to explain the holy scriptures in the Abbey of Moyenmoutier and Munster Abbey (1704), was appointed prior to Lay-Saint-Christophe (1714-1715) and became abbot of St. Leopold Nancy (1718). He went through the various monasteries of his order, devouring libraries and writing many historical compilations. In 1728, Calmet was called as priest of Senones Saint-Pierre Abbey, the capital of Principality of Salm. It is in the great abbey Vosges he worked and lived the last part of his life, maintaining a correspondence with many scientists, remaining there until his death on October 25, 1757. There are squares which bear his name in Commercy and Senones. There is also a Dom-Calmet Street in downtown Nancy since 18673 and a street of Metz in the Sablon district bears his name since 1934. 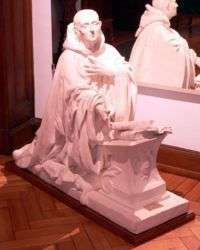 His monument is erected in St. Peter's Abbey Senones and includes a list of his works. le commentaire a été reproduit à part sous le titre de Trésor d'antiquités sacrées et profanes the commentary was repeated except under the title Treasury of sacred and profane antiquities" 1722 et ann. 9 v. suiv. Dictionnaire historique et critique de la BibleThese two capital works have been printed several times, and received considerable increases(version en ligne), Paris Historical and Critical Dictionary of the Bible 1722-1728 2 vol. m-fol. Histoire ecclésiastique et civile de la Lorraine, Nancy Ecclesiastical and civil history of Lorraine (1728) 4 vol., in-fol. Calmet was educated at the Benedictine priory of Breuil in the town of Commercy, and in 1688 joined the same Order at the Abbey of Saint-Mansuy at Toul, where he was admitted to profession on the 23 October of the following year. After his ordination, 17 March 1696, he was appointed to teach philosophy and theology at the Abbey of Moyenmoutier. Here, with the help of his brethren, he began to gather the material for his commentary of the Bible, which he completed at Munster in Alsace where he was sent in 1704 as sub-prior and professor of Biblical exegesis. The first volume appeared in Paris in 1707 with the title Commentaire littéral sur tous les livres de l'Ancien et du Nouveau Testaments (A literal Commentary on all the Books of the Old and New Testaments); the last of the twenty-three quarto volumes, owing to various delays, was published only in 1716. To satisfy the demand for the work a second edition in twenty-six volumes quarto was issued 1714–1720, and a third, enlarged, edition in nine volumes folio 1724–1726. A Latin translation by J. D. Mansi was published at Lucca, 1730–1738, in nine folio volumes, with new editions at Augsburg (1756, eight volumes folio) and Würzburg (1789, nineteen volumes quarto); another Latin translation by F. Vecelli appeared at Venice and Frankfurt (1730, six volumes folio). This shows how much the commentary was esteemed. But while it was received with high praise, even by Protestants, critics were not wanting, among whom may be mentioned the Oratorian Richard Simon. It cannot be denied that in spite of its merits and great erudition it is in some respects open to criticism. Difficult passages are often passed over lightly, and too frequently different explanations of a text are set down without a hint to the reader as to which is the right or preferable one. Quoi ! C'est dans notre XVIIIe siècle qu'il y a eu des vampires ! C'est après le règne des Locke, des Shaftesbury, des Trenchard, des Collins ; c'est sous le règne des d'Alembert, des Diderot, des Saint-Lambert, des Duclos qu'on a cru aux vampires, et que le RPD Augustin Calmet, prêtre, bénédictin de la congrégation de Saint-Vannes et de Saint-Hydulphe, abbé de Senones, abbaye de cent mille livres de rente, voisine de deux autres abbayes du même revenu, a imprimé et réimprimé l'Histoire des Vampires, avec l'approbation de la Sorbonne, signée Marcilli ! What! It's in our eighteenth century and there are vampires! It was after the reign of Locke of Shaftesbury of John Trenchard of Collins; it was under the reign of d'Alembert of Diderot of Saint-Lambert of Duclos that believed in vampires, and that the Rev Priest Dom Augustin Calmet, priest of the Benedictine congregation of St. Vannes and St. Hydulphe, abbot of Senones Abbey hundred thousand francs, neighbor two other abbeys of the same income, printed and reprinted the history of vampires, with the approval of the Sorbonne, signed Marcilli! Calmet was given much praise for his work and received many letters and dissertations regarding the subject which prompted him expand his work in two-volumes and published it again in 1751 under a new title Traité sur les apparitions des esprits et sur les vampires ou les revenans de Hongrie, de Moravie, &c. (i.e. "Treatise on the Apparitions of spirits and Vampires or Revenants of Hungary, Moravia, et al"). It included further studies of his own as well as several letters and dissertations sent to Calmet as a response to the first publication. ambiguously considered the possibility of the existence of vampires, although not stating it explicitly. In his later years Calmet published some further Biblical dissertations in the Bible de Vence (1742). Among his other published works may be mentioned: (1) Histoire universelle sacrée et profane, (Universal History, Sacred and Profane) depuis le commencement du monde jusqu'à nos jours (Strasbourg, 1735, quarto), in which he follows the ideas enunciated in Bossuet's Discours sur l'histoire universelle; (2) Histoire ecclésiastique et civile de la Lorraine (Ecclesiastical and Civil History of Lorraine) (Nancy, 1728), of great value for the history of that province; (3) Bibliothèque lorraine (A Catalogue of the Writers of Lorraine) (Nancy, 1751), containing his autobiography (pp. 209–217); (4) Commentaire littéral historique et moral sur la règle de Saint Benoît (A Literal, Moral, and Historical Commentary on the Rule of Saint Benedict) (Paris, 1734). Calmet wrote a noted history of the Duchy of Lorraine, as well as a history of the Abbey of Senones, which was still in manuscript form at the time of his death. ↑ Senones, Moyenmoutier, Étival country abbeys in Lorraine. O.T. country abbeys, 2007, pg.62. ISBN 978-2-9529604-0-3. ↑ Calmet, Augustin (1751). Treatise on the Apparitions of Spirits and on Vampires or Revenants: of Hungary, Moravia, et al. The Complete Volumes I & II. Transated by Henry Christmas & Brett R. Warren. 2015. ISBN 1-5331-4568-7. ↑ "www.chouette-noire.com/bibliotheque/Traite%20app%20et%20vamp/don%20Calmet.htm – Translator". Microsofttranslator.com. Retrieved 2013-12-01. This article incorporates text from a publication now in the public domain: Chisholm, Hugh, ed. (1911). "Calmet, Antoine Augustin". Encyclopædia Britannica (11th ed.). Cambridge University Press. This article incorporates text from a publication now in the public domain: Bechtel, F. (1913). "Dom Augustin Calmet". In Herbermann, Charles. Catholic Encyclopedia. New York: Robert Appleton. Wikimedia Commons has media related to Augustin Calmet.